The City of Winterset would like to recognize the Wight Family for a very generous donation to fund the City Park Entrance Project. Work is scheduled to begin this spring. The project involves removing the existing chain-link fencing along E. South Street and replace it with limestone columns, wood railing fence, sign, ascent lighting, and plantings. It is with great gratitude of this gift and appreciation for lives well lived that we share a little info about the Wight family in this program guide. Both Bernard and Frances were born in Madison County in 1922. They married in 1946 and had three children, Cristal Smith (Murray), Mark Wight (Jennifer) and *Noel Wight (Jane). 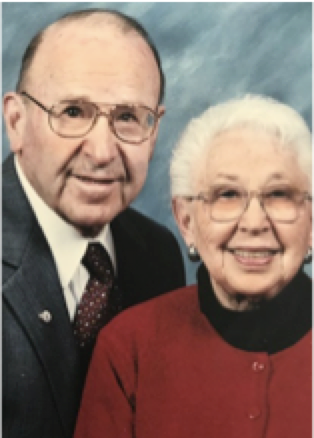 Bernard and Frances loved living/working in Winterset and were very involved in the Winterset United Methodist Church and numerous community service clubs/organizations throughout their lives. Frances had many talents including cosmetologist, businesswoman, artist, craftswoman, and conservationist. After graduating from WHS in 1940 Bernard (Barney) attended Iowa State College (now ISU). He then enlisted in the United States Coast Guard serving his country during WWII. Upon returning to Winterset and getting married he worked at the Mobil Service State a block north of the square. Eventually, Barney and Frances formed a partnership, Wight and Short Mobil and Farm Bulk Delivery, with Willard and Eva Short. They would go on to build the new Phillips 66 station on the north edge of town. Barney felt it was a privilege and a joy to give back with his time and talents. He served on the Winterset City Council, Madison County Memorial Hospital Board, Winterset School Board and Lakeview Country Club Board of Directors. Frances passed away in 2014 and Barney in 2018. Love of family was very important to Frances and Barney. They also had a love of nature and enjoyed their walks through parks in 48 different states. City Park was dear to them. Even in their later days, rides around town included trips through City Park. As a result of their love of community and parks this donation to improve City Park in their memory is very fitting and very much appreciated by the Winterset Community.